Built atop the earlier location of the Temple, the Dome of the Rock was erected by the Muslim ruler Abd el-Malik in 688-691. 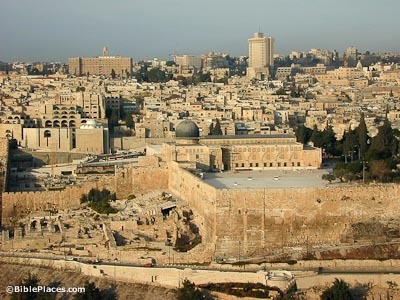 Because of its situation on bedrock, the numerous earthquakes over the centuries have not caused significant damage to the structure (unlike its neighbor Al Aqsa mosque). This shrine was covered by a lead dome from 691 until it was replaced with a gold-colored covering in the early 1960s. Because of rust, the anodized aluminum cover was again replaced in 1993 with a gold covering. The Mt. 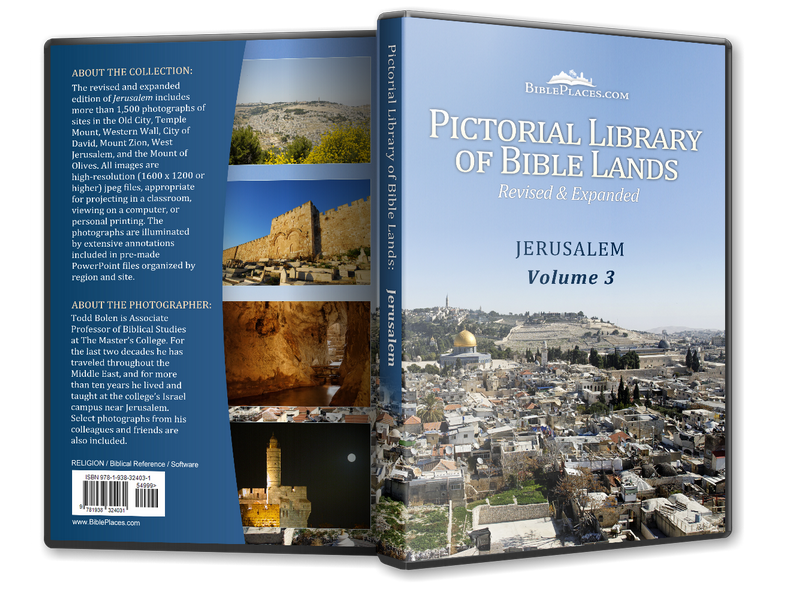 of Olives overlooks the Temple Mount from the east and gives a picture of Jesus’ weeping over the city from the Mt. of Olives (Luke 19:41). From the Temple Mount Jesus delivered the famous “7 Woes” against the Pharisees (Matt 23), probably pointing at tombs on the Mt. of Olives in his discourse (v. 27). Jesus’ ascension probably took place some distance behind the tower of the Russian Orthodox Church. 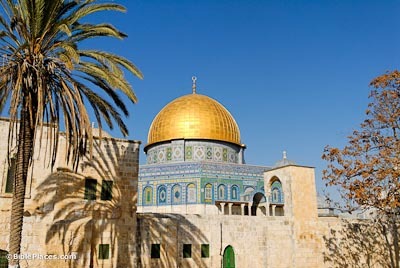 Sometimes referred to as the “Mosque of Omar,” actually the Dome of the Rock is neither. 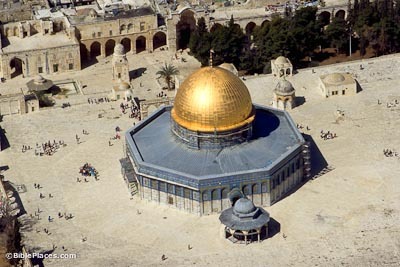 Omar built an earlier structure, but not the Dome of the Rock. And this building is considered a shrine and not a mosque. Men pray instead at the Al Aqsa mosque located 200 meters to the south. 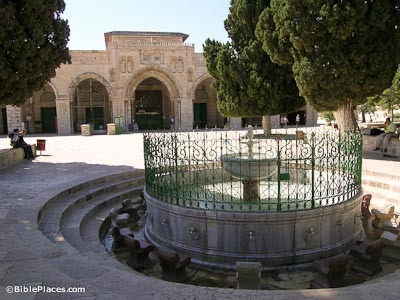 Muslims believe that this is the place where Abraham nearly sacrificed his son Ishmael. 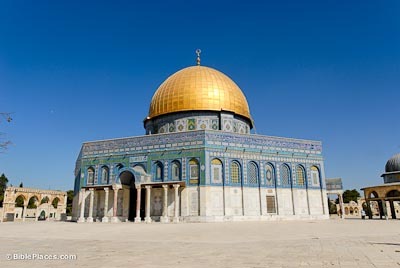 More important to the Muslims than the Dome of the Rock is Al Aqsa Mosque. 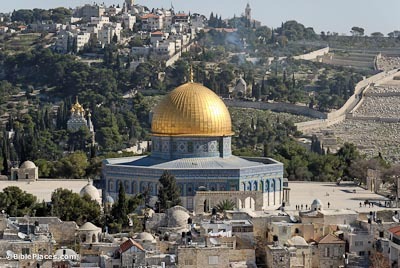 Believing that this is the place referred to in the Koran as “al aqsa” (the furthermost), Muslims have sanctified this as the third most holy place in the Muslim world (after shrines in Mecca and Medina, both in Saudi Arabia). The original mosque was built in 715 but it has been destroyed numerous times by earthquakes. The mosque witnessed a turbulent 20th century. King Abdullah of Jordan was assassinated in front of Al Aqsa in 1951. A deranged Australian tourist set fire to the mosque in 1969, destroying the beautiful 12th century wooden pulpit. Controversy now rages over building activity on a larger mosque constructed underneath this one.